Thirty-eight National Honor Society students at JCB took part in a community cleanup project on April 27. National Honor Society students at JCB stand in the school’s parking lot just before splitting up into small groups to clean their community’s parks and roads. The student volunteers broke out into small groups and picked up trash from mapped out areas in the village of Phoenix. The six groups were able to cover every road in the village, from Farley and Henley Park to all three schools and Main Street. Each student collected at least two bags of garbage, totaling approximately 65 bags. Large abandoned items included coolers, chairs, shovels, hub caps and even a kiddie pool. After completing their service, students were rewarded with bananas, chocolate milk, and donuts from Just Donuts. 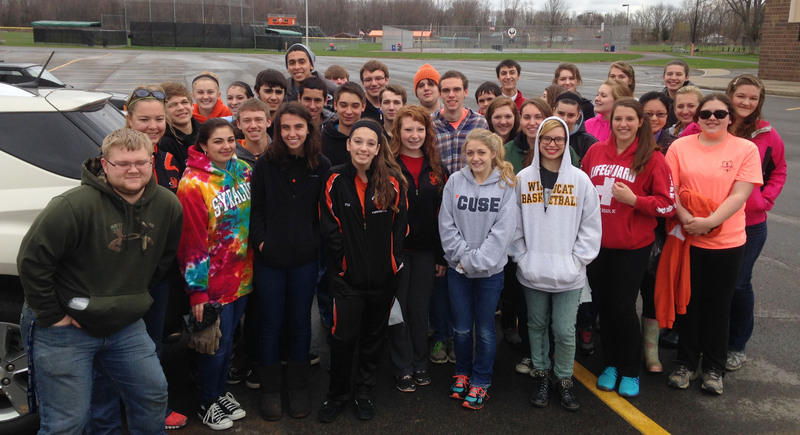 NHS members who missed the cleanup were asked to do an extra two hours of service (of their choice).